Let me start by making two bold assertions. 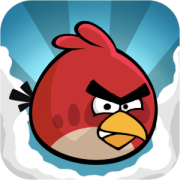 1) Many of us on the spiritual Journey are, at times, sanctified, little versions of Angry Birds. 2) Anger is a valid and extremely useful emotion for all who seek to walk in Love. Anger is a primeval facility wired within our central nervous system whereby we regain our inner space once it has been crossed by an unwelcome other. It is the alarm bell and emergency response to a psycho-spiritual incursion all rolled into one. Without anger there’s nothing to stop another soul from encroaching upon our inner holy of holies without repercussions. It’s our first line of defense in letting another know that we’re not happy bunnies, those willing to lie down and let an intruder take something precious that belongs to us. Anger is designed to be a short, sharp defensive measure, a self-regulating one that ought to get the message across without permanent or lasting emotional damage. Once our other gets the message a more satisfactory re-establishment of boundaries may be negotiated. So how come we religio-spiritual types are often little, Angry Birds? Well, I believe that below the beatific smiles of our public, spiritual persona there lies trapped emotions and energies, one of which is often anger. Such energies require expression and release. They need to complete the journey plotted out for them by our internal powers of recovery. If they can’t be freed from the cellar of our lower unconscious they’ll manifest in other more demanding ways viz depression and physical illness, particularly muscular, tendon or nerve related pain. Anger is one of our normal human emotions often frozen by the adoption of our spiritual stance subsequent to a conversion or enlightenment experience. In such a dramatic change of Self perception we often get a glimpse of the real us, that spirit spark placed within by Divine Love. Such a radical change of perception can keep us going for a while along the newly travelled spiritual path but eventually our inner world of the lower unconscious will need examination and airing. Thankfully Spirit Breath gives us time to settle into our new way of life before the Divine Spring-cleaning begins in earnest. Much of our trapped anger was cut short and frozen in childhood or infancy. A slap across the thighs in the isle of a supermarket by our frustrated and indeed angry mother may have shocked us into a state of emotional paralysis. Years later, this cut short anger, lies dormant in the freezer of our inner self. Other frozen angers have their origin within the religious or spiritual life. In the intense cauldron of faith or spiritual communities many lines are regularly crossed. In some cases this in done intentionally, as in abusive groups, in others it is as a result of a false interpretation of the family of God. In religious or spiritual mindsets, where our oneness is overemphasized, to the detriment of our unique sense of Self, many inter-personal infringements can occur that automatically trigger our psychological defense mechanisms. Our conscious mind, not wanting to appear disruptive or even more unacceptable, unloving, shuts down the outward expression of our psychic response force. Locked away and repressed in the lower unconscious, misinterpreted as a sin of the flesh, our far from dead anger begins to find an alternative route of expression and escape. The intense energy has to go somewhere and often does. By definition most faith or spiritual mindsets rule out a valid and controlled channel for the resolution of psychic or indeed physical boundary incidents. The holy writings of many groups suggest practical ways to address such issues but in practice the pressure to conform and be a loving member who doesn’t rock the boat, takes psychic precedence. In other words I’m suggesting that we spiritual types may be a lot angrier than we realise; we’re good at smothering our inner vexation by appearing to detach from our animal hard-wiring and going into freeze mode. In my next post I’ll look at how leaving a faith or spiritually community can open our personal can of angry worms.